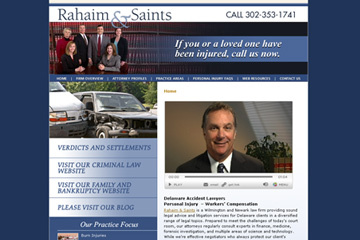 Formed in 1993, Rahaim and Saints, LLP is a full service law firm concentrating in the areas of Personal Injury, Workers Compensation, Criminal Defense, Bankruptcy and Domestic Relations. No charge for consultations in all areas except Family Law. The firm has 6 attorneys and two convenient offices. In addition to our Peoples Plaza office, we are located at 2055 Limestone Road, Suite 211, Wilmington, Delaware 19808. Call 302-832-1800 to schedule an appointment at our Glasgow location or 302-892-9200 for our Limestone Road office.